Canon’s new CJ45ex13.6B 2/3-in. 4K portable EFP lens made its live-production debut on Tuesday, deployed for coverage of the MLB All-Star Game on one of Fox Sports’ two low-home robotic cameras to cover the pitcher and home plate. Canon’s new CJ45ex13.6B 2/3-in. 4K portable EFP lens debuted in Fox Sports’ coverage of the MLB All-Star Game. The CJ45ex13.6B, which started shipping recently, offers high-level 4K optical performance, 45X high zoom ratio (and as far as 1,224 mm with the built-in 2X extender), and faster servo operation in the size of an HD super-telephoto lens. With a wide-angle focal length of 13.6 mm, the extensive focal range allows sports producers to cover a wide range of the field with a single lens. The new built-in image-stabilization system features higher-frequency vibration suppression and panning operability. 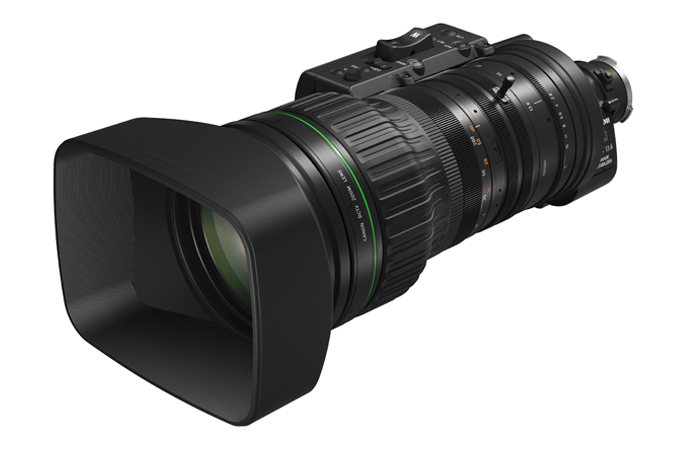 A high-performance digital drive unit improves servo performance compared with Canon’s HJ40x-generation lenses and can achieve the full focal-range zoom in 1.2 seconds, aperture range in 1.3 seconds, and focus range in 1.8 seconds. The drive unit also supports virtual systems with three 20-pin connectors and includes a digital information display for easier operation.